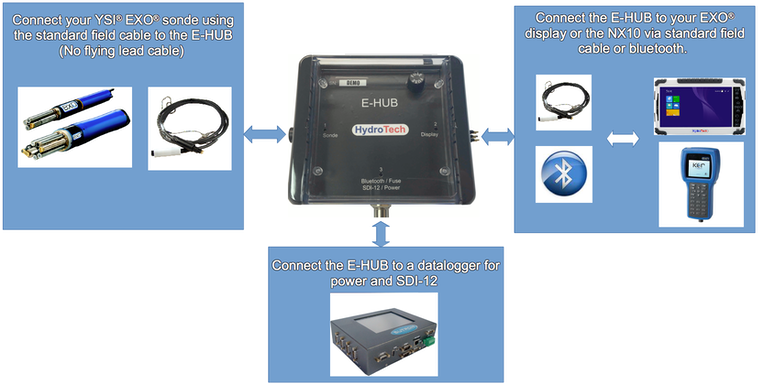 No more Bluetooth for calibration only: Now the E-HUB provides you with bluetooth connectivity to your EXO® unit in the field without interruption of your SDI-12 data. No more bare wires to deal with: The E-HUB supports the standard wet mateable connections for the EXO® sonde and display. No more cleaning Zeros from the data: Once on site, you can connect your display or NX10 to the available port or via bluetooth and access the field sonde data without any SDI-12 interruption or disconnect. No more having to stock two different cables: With the E-HUB, you can install the EXO® sonde using the standard handheld cable used with the EXO® display. No more guessing during troubleshooting: The E-HUB LEDs allow the end user to determine the source of any power failure. The E-HUB includes power management circuitry that allows auto switching power, regulated power, and current spike protection for sonde and internal E-HUB circuitry. The E-HUB includes power management circuitry that allows auto switching power, regulated power, and current spike protection for sonde and internal E-HUB circuitry. Size: 150.6 mm x 127 mm x 63.5 mm. Total with connectors and antenna: 185.5 mm x 177.8 mm x 63.5 mm. Q: If I purchase an E-HUB do I still need the YSI® EXO® DCP signal output adapter? Q: When I want to connect to the E-HUB via bluetooth, do I have to enable the EXO® sonde bluetooth? A: No, the E-HUB bluetooth is completely independent from the sonde bluetooth. Q: When I connect to the E-HUB via cable or bluetooth, will that affect my SDI-12 data? Q: Can I connect my display to the E-HUB via a cable and bluetooth at the same time? A: No, the hand held unit always looks for the cable connection first. Q: Does the E-HUB provide power to the EXO® sonde? A: Yes, the E-HUB provides a regulated 12 volts to the EXO sonde. Q: Does the E-HUB have surge protection? A: Yes, the E-HUB is equipped with a 1Amp fuse. Q: How do I know if the fuse is bad? A: If the E-HUB fuse is bad, LED number 3 will be solid red. Q: Can I replace the fuse in the field? A: Yes, the fuse is easily replaceable in the field. Q: If the field station loses power, can I still connect to the EXO® sonde via the E-HUB to retrieve live data? A: Yes, even when the E-HUB is not powered, it will allow the hand held unit or the NX10 to power the sonde. Make sure to enable the power function to the sonde on the KOR® software. Q: Where can I buy an E-HUB? A: The E-HUB is available for sale through the USGS HIF or directly from HydroTech.